Product prices and availability are accurate as of 2019-04-11 13:44:39 EDT and are subject to change. Any price and availability information displayed on http://www.amazon.com/ at the time of purchase will apply to the purchase of this product. This listing is for a new premium quality print of the aircraft carrier USS Ronald Reagan (CVN 76). Pacific Ocean (Jan. 13, 2006) - The Nimitz-class aircraft carrier USS Ronald Reagan (CVN 76) transit the Pacific Ocean. 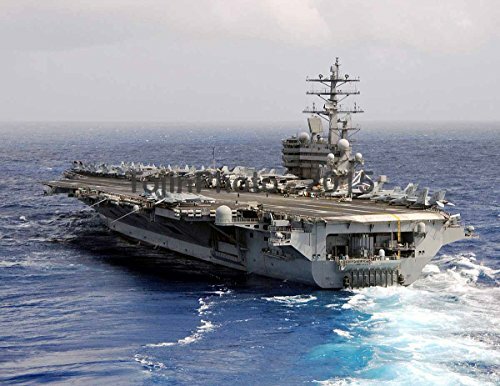 Reagan is currently underway on its maiden deployment in support of the global war on terrorism and maritime security operations.